Similar to other resources, it is a scarce commodity. Some of the destruction of this valuable natural resource is irreversible. The reduction of agricultural land will reduce our food supply capacity, and the destruction of environmental sensitive areas, such as wetlands, will affect the habitat and ecology of wildlife. The use of land unsuitable for development may bring harm to both the natural environment and human life. With increasing population and rapid economic development, there is a concomitant increase in land consumption. The encroachment of urban land use on agricultural land and environmental sensitive areas is a problem in many rapidly growing regions in Asia. The diminishing of agricultural land and environmental sensitive areas is affecting sustainable development of the region. There is a need to examine the amount of land consumption and their distribution in Asia to see how it is affecting sustainable development. 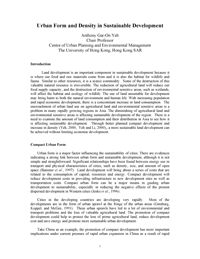 Through better planned compact development and increase in density (Yeh, 2000; Yeh and Li, 2000),, a more sustainable land development can be achieved without limiting economic development.